"How to get rid of wood beetles" is a question most people hope they never need to ask. However, considering that wood boring beetles can easily hitch a ride into your home via wooden furniture, flooring or lumber you've newly acquired, and then begin turning the all wood in your home into powder, "how to get rid of wood beetles" is a question many home owners suddenly and unexpectedly have to face. This site is designed to give a quick and informative summary for those experiencing a problem with wood beetles. Wood Beetles: How do you know if you have them? You've got to be a detective, as most of the damage is occurring out of sight within wooden furniture, flooring, siding, structural members of your home. The main signs are the small pin holes the beetle larvae make as they emerge from the wood, usually at night, then mate in order to lay they eggs (above image credits: Clemson.edu) You may also see powdery "frass", fine dust excavated by the larvae and pushed out of the pin hole (image credits: ucdavis.edu). Common wood boring beetles. 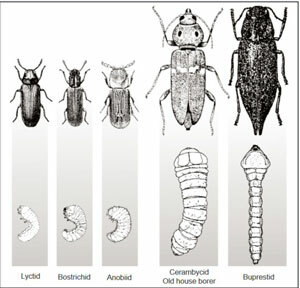 The most common types of wood boring beetles are shown below, in the adult and larva stage of development. How Do Wood Beetles Breed? 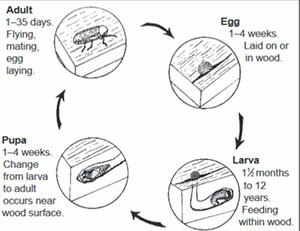 The life-cycle of many wood boring beetles can be as long as 12 years, much of the time during which they lie dormant or hidden, actively destroying anything made of wood. Some wood boring beetles go for hardwood, others for soft wood, some for dry wood, others for damp wood. If it's wooden, there's a wood boring beetle that would love to turn it into powder! How Did The Wood Beetles Get There? Clear away and destroy any dead tree limbs, brush and branches. Keep them away from lumber and furniture that is being stored, and far away from any wooden structure. Destroy old scrap lumber. Leaving it lying around invites infestation. Thoroughly inspect all furniture and lumber you plan to introduce into your home or business structure. Look for the presence of beetle pin holes. Paint, varnish and seal all wood. Open pores are an invitation for egg laying. Don't store firewood in your home. Bring in only the wood you plan to burn that same day. The cure is much more difficult than prevention since wood boring beetle eggs can lie dormant and hidden in infested lumber or furniture for up to 12 years or more. If possible, you may be better off removing and destroying all infested wood. The alternative is to have the infestation spread throughout the building. Even it means replacing an entire hardwood floor, you may still be better off. If the infestation is in a small piece of furniture, it may be possible to heat-treat it. You'll need to raise the temperature to about 130 or 149 degrees F for 6 hours, or freeze at zero degrees F for 72 hours. If it doesn't fit in the oven or freezer (i.e. your infested hardwood floor), an insecticide treatment or fumigation MAY be effective. The most effective insecticides must be applied by a licensed pest control professional. The stakes are pretty high when it comes to a wood boring beetle infestation. For example, it you may be better off replacing an entire infested hardwood floor than attempting a wood treatment solution and hoping that does the trick. Remember, the life cycle of some of these wood boring beetles is 12 years during which time they may lie dormant, or be secretly destroying large amounts of wood in your home. Before you make a big decision, get a professional assessment of the situation. 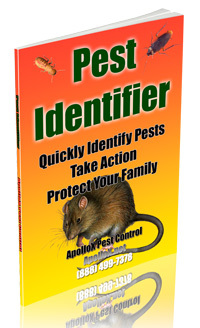 ApolloX Pest Control Has The Skill, Experience and Equipment to Get Rid of Wood Beetles! How to Get Rid of Wood Beetles? Do you think you have a wood beetle problem? Don't wait until they further multiply and turn the wooden structure and furniture of your home into powder.